Karya Turned wood This spinning top is made of durmast and ash wood. The design was inspired by the myth of Karya, nymph of the forest and the ash tree. The wood on which the spinning top is placed has been carved in such a way as to guide the spinning top around, recalling the dance of the nymph. The key idea behind Antonio Licitra's objects was that of “playing with nature”. He thought of movement, of dance, and from here came the image of nymphs dancing between trees. The design for the two spinning tops arose from this image. 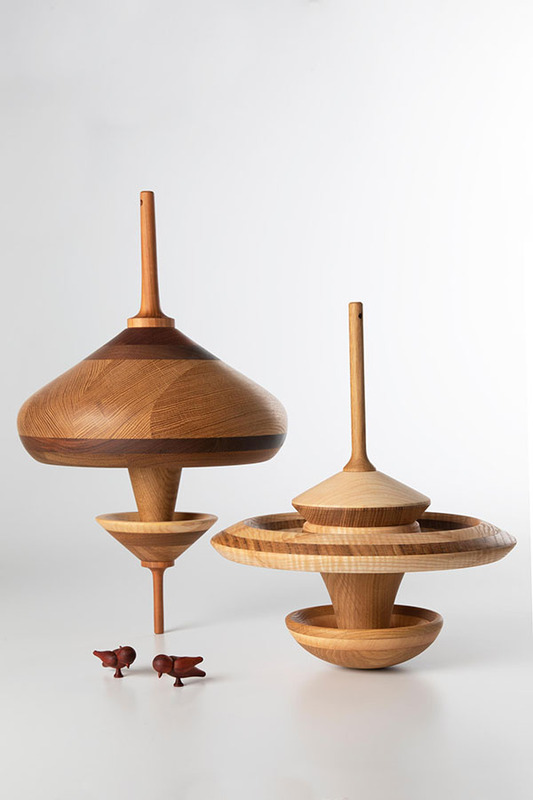 Spinning tops that dance so elegantly on their board but also conjure childhood memories. Antonio Licitra grew up in a small town in Sicily. As such, he draws much inspiration from the sea, nature and mythology. Between 2011 and 2014 Antonio studied sculpture at the Scuola dell'Arte della Medaglia - Istituto Poligrafico e Zecca dello Stato, in the field of craftsmanship and design. He went on to complete a Master's in Advanced Goldsmithing and Jewellery Design at the Scuola Arti Ornamentali in Rome and a postgraduate degree with the Creative Academy in 2017. Antonio now works as a high jewellery junior designer for Giampiero Bodino S.R.L. Antonio aims to give movement, depth and life to each jewel; to do so, he uses life experiences. 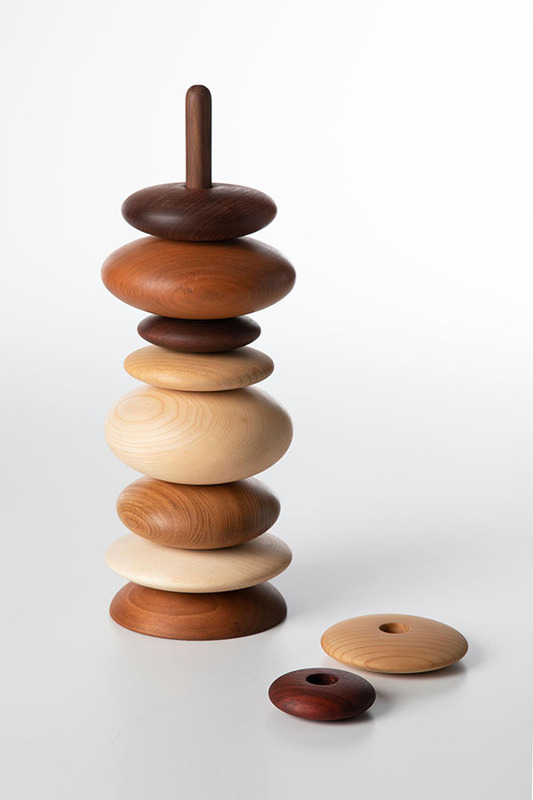 Zen Turned wood Inspired by children's tower constructions, this ornamental object recalls stone balancing games. Wood has been turned into different sized ovoid forms held together by a central column. The different woods emit essences with relaxing properties. Andrea Di Giuseppe liked the notion of creating objects that have two souls: a playful one and a decorative one. Andrea wanted to create modular pieces that would draw people to interact with them. He tried to stimulate the senses with the use of wood essences that release fragrances, colour variants and relaxing properties. Andrea Di Giuseppe completed a degree at the Academy of Fine Arts of Rome in 2013, then went on to complete a Master’s at the Istituto Poligrafico e Zecca dello Stato Scuola dell'Arte della Medaglia in the field of Design and Applied Arts between 2013 and 2016. In 2017, he was one of 20 students to follow a postgraduate degree with the Creative Academy. Following his studies, Andrea undertook an internship as a watch designer at Jaeger-LeCoultre in Switzerland. Poppie Turned wood Three wooden totem-like shapes made of cherry and padauk wood have been turned into different forms. The shapes evoke the South African Ndebele dolls that traditionally represent themes of maternity and marriage, and evoke affection and endearment. Catherine Ferreira took inspiration from her country’s traditions by using a South African feminine symbol of great expressive power. The typical dolls that you may find everywhere in South Africa as souvenirs represent fertility and maternity. Catherine Ferreira graduated with a BA in Metal and Jewellery Arts in 2013 and with a MA in Jewellery Design in 2015 from the Stellenbosch University, following which she undertook a postgraduate degree at the Creative Academy. Catherine now works as a graphic designer in South Africa for House of JD. 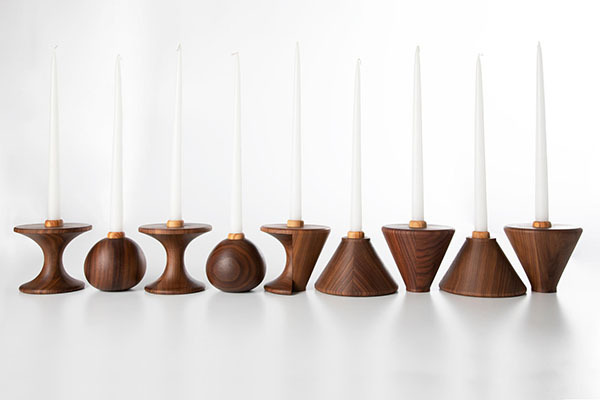 Geometry Turned wood These five candlestick holders were inspired by forests and trees that grow tall as they break through undergrowth to absorb sunlight. 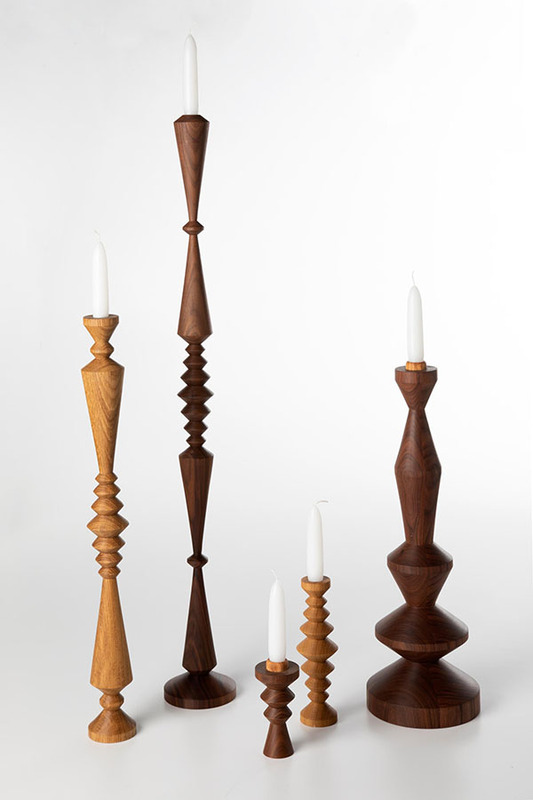 Made of black walnut and durmast wood, they vary in size and geometric form. Iryna Kharchenko initially thought of a forest burning. Then her idea evolved into a forest that instead of losing life because of fire brings light with fire. Iryna Kharchenko graduated with a Master’s degree in Architecture from Kyiv National University of Construction and Architecture, Ukraine, in 2014. She then undertook a postgraduate degree at the Creative Academy and an internship with Cartier as a junior designer. Artemis Turned wood These enormous ceiling hung spinning top shaped sculptures made from turned wood each include circular open baths. These were inspired by the myth of Artemis, goddess protector of wild animals. Following the example of the goddess, these baths take care of animals, here represented by a tiny wooden bird poised to drink out of the baths. Antonio Licitra started with the idea of “feeling nature” through various senses. Not only through touch but also sight and sound. The idea that mankind should give back to nature was also central to this piece. This is how Antonio came up with the idea of birdbaths, created to protect the small animals from bad weather - just like Artemis in mythology - and enabling you to not only see the birds, but also hear them sing. 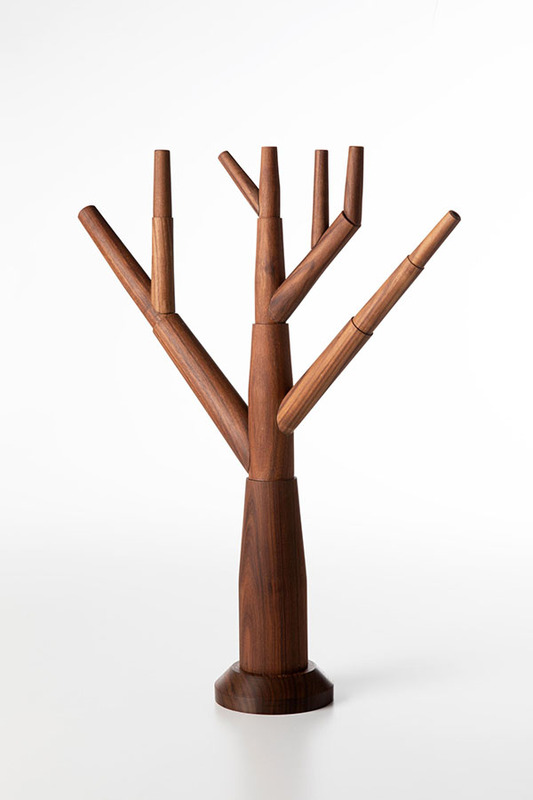 Hanukkiah Turned wood Hanukkiah is a nine-branched candelabrum lit during the eight-day Jewish holiday of Hanukkah, in contrast to the seven-branched menorah used in the ancient temple. 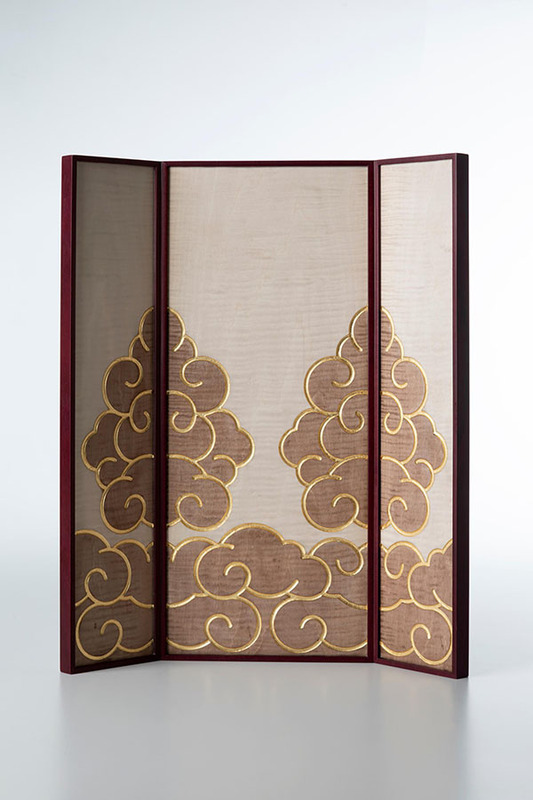 Maria Grossman was inspired by an important symbol for her religion. She also plays on the relationship of light and shadow as a metaphor, recalling times before her family moved to Israel when they had to hide their religious belief. Contrasts are important in her work: light and shadow, symmetrical and asymmetrical, positive and negative. Maria Grossman studied jewellery and accessories design at 'Shenkar – Engineering. Design. Art' in Israel between 2011 and 2016. In 2017, Maria was one of 20 students to follow a postgraduate degree with the Creative Academy. She continued as a design intern at Lancel. 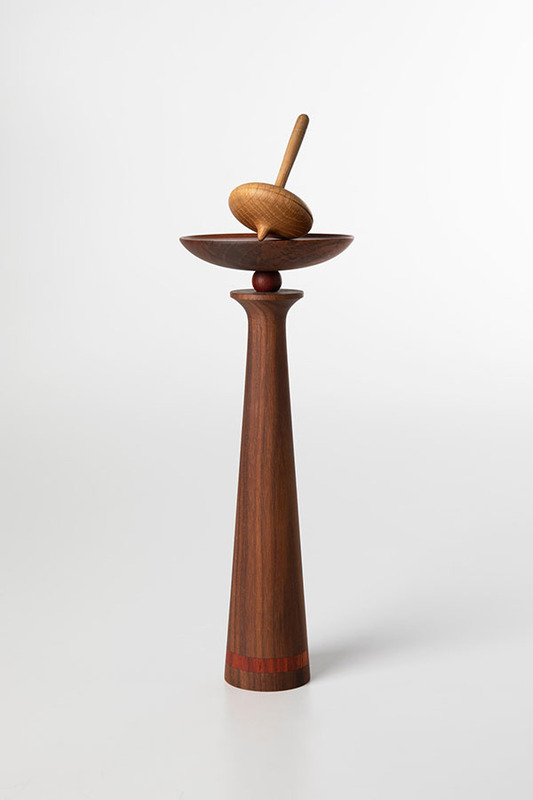 Melia Turned wood Placed on top of a cone-like column, this spinning top is inspired by the story of Melia, a dancing nymph of the forest and of the walnut tree. The key idea behind Antonio Licitra's objects was that of “playing with nature”. He thought of movement, of dance and from here came the image of nymphs dancing between trees. The design for the spinning top arose from this image. 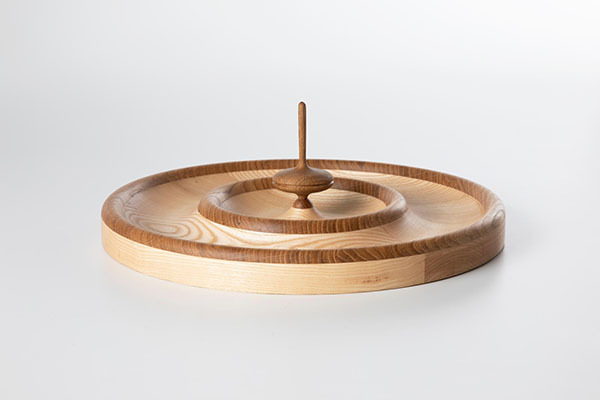 A spinning top that dances elegantly but also conjures childhood memories. Klee Turned wood Inspired by studies of Paul Klee and Piet Mondrian on modular growth of tree branches, the combined cones that shape this black walnut vase evolve from bottom to top, from the biggest to the smallest. Andrea Di Giuseppe liked the notion of creating objects that have two souls: a playful one and a decorative one. Andrea wanted to create modular elements that would draw people to interact with them, and tried to stimulate the senses with the use of wood essences, colour variants and relaxing properties. Kieries Turned wood Symbols of strength, perseverance and unity, Knopkieries (knob walking sticks) on South Africa’s coat of arms were traditionally used as weapons and also during spiritual ceremonies of Southern African tribes. Catherine Ferreira drew inspiration from her country’s traditions by using a South African masculine symbol of great expressive power. 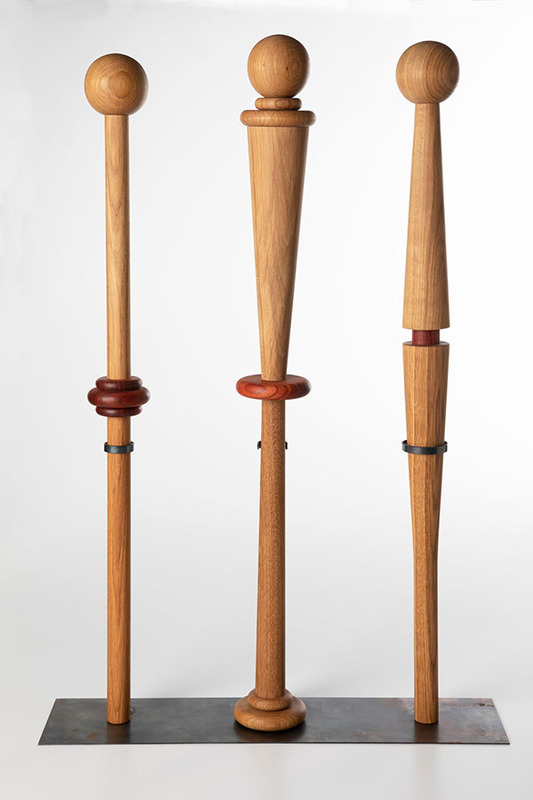 These walking sticks are typical of the tribes, and were also used in brawls during the fight against apartheid and are therefore symbols of liberty, so much so that they appear on South Africa's coat of arms. 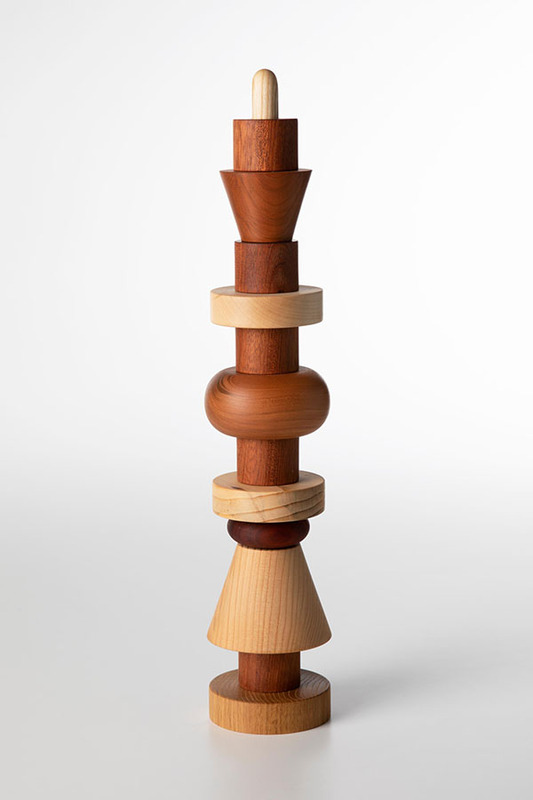 Homage to Sottsass Turned wood The symmetric design of this thin pole-like object takes its inspiration from children’s tower construction games. 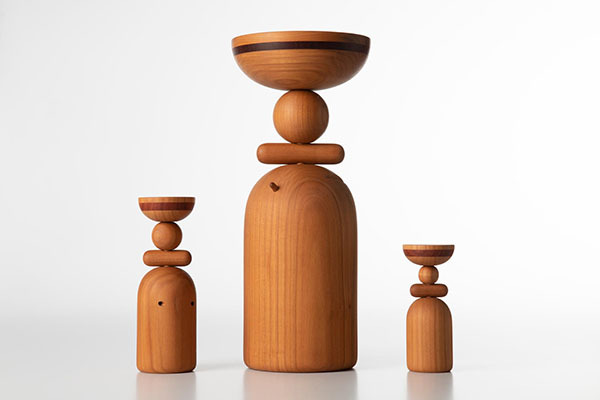 The shape also evokes the famous Totems created by the Italian designer Ettore Sottsass. Andrea Di Giuseppe liked the notion of creating objects that have two souls: a playful one and a decorative one. Andrea wanted to create modular elements that would draw people to interact with them. He also tried to stimulate the senses with the use of wood essences, colour variants and relaxing properties. Ventium Furniture Taking its title from the Latin word for “fan”, Ventium aims to use the mastery of marquetry to emulate the physical form of wind in nature. Andrea Tan’s project considered the juxtaposition of the “heaviness” of wood and the lightness and movement of nature. She uses wind as an essential element of the piece. 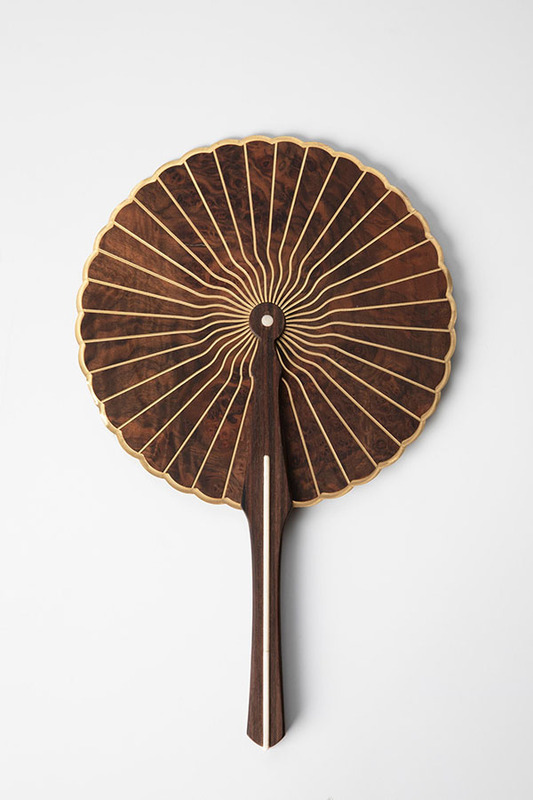 Andrea liked the idea of the movement of air and the movement created by the wood grain of the fan. She also appreciates the geometry that is created by closing the fan. She chose a Latin name in homage to Europe. Research and innovation complement Giordano Viganò’s irreplaceable technical knowledge of cabinetmaking ingrained over fifty years to create finely finished masterpieces. Giordano couples wood with other materials such as glass, silver and bone, thus combining traditional techniques and innovation. The aesthetic value of each piece is guaranteed by the careful selection and combination of precious materials. Giordano does not wish to produce pretentious or spectacular pieces but rather to accentuate the pure beauty of the minute details within the meticulous finishing of his works. Andrea Tan studied at the University of Arts, London between 2012 and 2016. In 2017, she attended the postgraduate programme at the Creative Academy along with 20 other students. Following this, she worked as a junior designer for Montblanc. 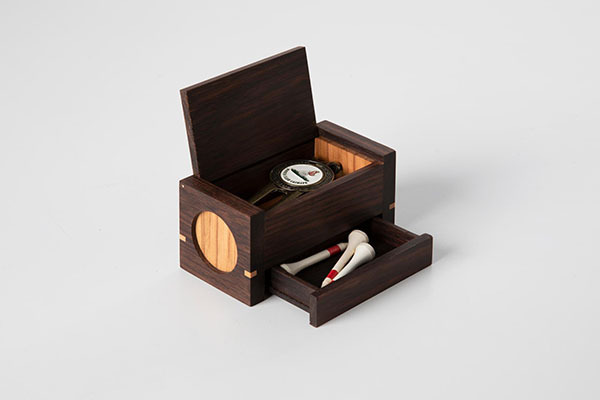 Fairway Furniture This box for golf accessories connects golf and nature. 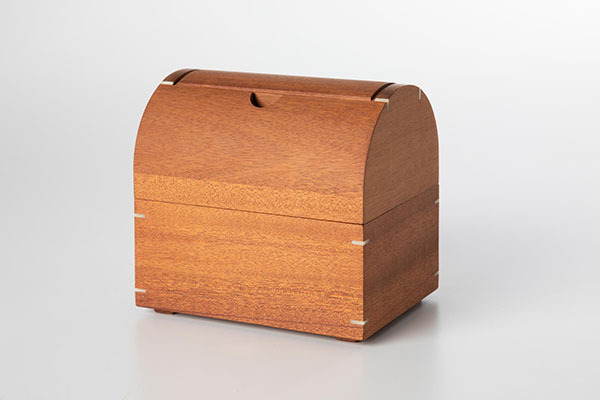 The box has been realised using different wood essences. Guillaume Graff loves golf, it is his favourite sport and is played completely immersed in nature. So he wanted to create accessories for this sport in wood, partly because originally this is how they were made, and also because he wanted to convey his respect for nature and for the environment, which welcome players during the game. Guillaume Graff studied Transportation Design Management at the Institut Supérieur de Design Valenciennes in France between 2007 and 2012. After working as a freelance designer for a number of years, Guillaume completed a postgraduate degree at the Creative Academy in 2017. He then worked as a watch designer for IWC. 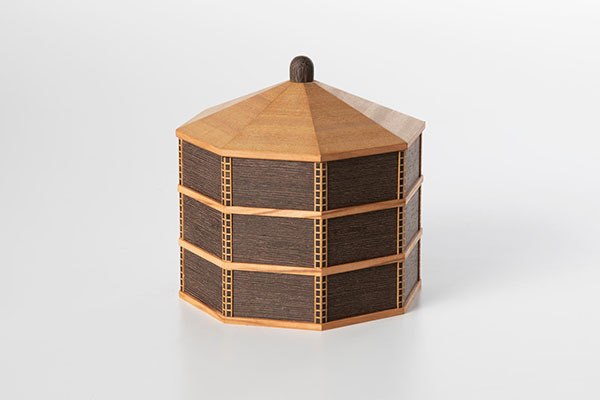 Battistero Furniture Octagonal jewellery box inspired by the Florentine St. John Baptistery. This piece is part of a project entitled Discovering Treasures. The title is reflected in this piece in terms of the Italian architectural masterpiece that it was inspired by and in its purpose as a jewellery box. Eugenio Sciarra played with the concept of architecture, to be “discovered” and “uncovered” in order to access the treasures inside. Following his studies in the field of decoration at the Academy of Fine Arts in Rome, Eugenio Sciarra studied at the Scuola dell' Arte della Medaglia, Istituto Poligrafico e Zecca dello Stato between 2010 and 2013. He then completed a postgraduate degree at the Creative Academy in 2017. Before starting work as a freelance designer, Eugenio completed an internship with Vacheron Constantin in Switzerland. 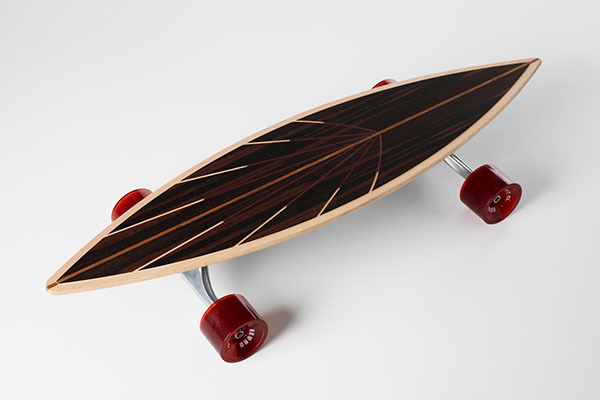 Curve Furniture The Curve skateboard was inspired by Giordano Viganò's artisanal excellence in wood marquetry. Traditional materials used in the production of skateboards were used whilst playing on the feelings and movement of the sport, conveyed by smooth curves and minimalistic lines. The pattern develops into a palm leaf. 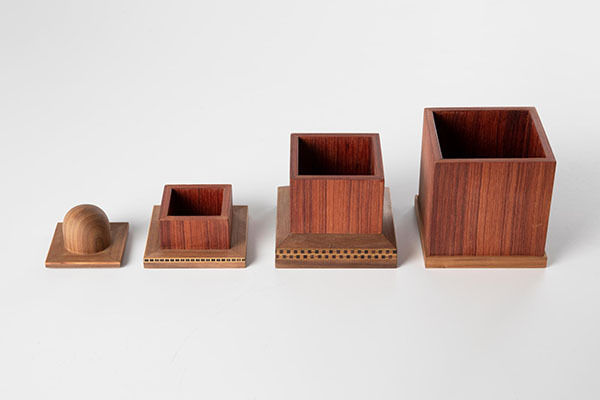 For Elizabeth Lee, wood, a natural material, evokes simple shapes and geometric lines. So she envisioned a leaf. From there she thought of the sense of liberty of surfing and skateboarding. Air, nature and the fact that these boards were originally made of wood led Elizabeth to combine nature, tradition and contemporary sport. Elizabeth Lee is a jewellery designer born and based in London. She studied at Central Saint Martins before completing a Masters course at the Royal College of Art, London and subsequently at the Creative Academy in Milan. Elizabeth is drawn to objects that span across different disciplines whilst retaining a sense of craftsmanship. In addition, her particular interests lie in the ethereal and romantic qualities of light, which she finds captures the essence and nature of objects in an emotional and engaging way. This can be seen in her graduate collection, Digital Interlude, consisting of a million hand cut hexagons in thin sheets of printed acetate. The collection looked into the idea of a virtual and elusive space enveloping the body and playing on the idea of light jewellery. Vanvitelli Furniture Inspired by Italian architecture, this jewellery box recalls the Royal Palace of Caserta, hides treasures inside and evokes the beauty of Italian monuments. This piece is part of a project entitled Discovering Treasures. The title is reflected in this piece in terms of the Italian architectural masterpiece that it was inspired by and in its purpose as jewellery box. Eugenio Sciarra played with the concept of architecture to be “discovered” and “uncovered” in order to access the treasures inside. 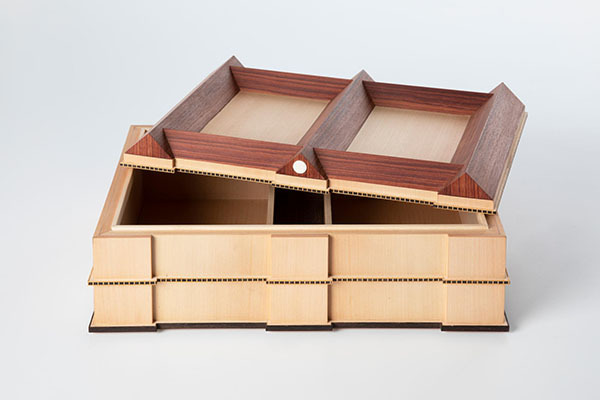 Filarete Furniture Jewellery box inspired by the Milanese Filarete Tower. played with the concept of architecture, to be “discovered” and “uncovered” in order to access the treasures inside. Volta Furniture The design of this elegant and practical shoebox draws its inspiration from a historic symbol of Lake Como: the Lucia boat used to transport fish or people. Giulia Maria Vavassori is from Lake Como and therefore her first inspiration was the boat so typical of that lake, the one that everyone knows from the novel I Promessi Sposi. Giulia likes the idea that the vaulted lid that covers the shoe box can be taken off, exactly like the cover of the boat, to discover an object that is “ordinary” and useful. Born in 1994, Giulia Maria Vavassori grew up in Italy. She has always been passionate about art and design. After studying in Como, Giulia continued her studies between 2013 and 2016 at the Milan Polytechnic Faculty of Fashion Design where in the third year she specialised in design of accessories and jewellery. Following her BA, Giulia undertook a postgraduate degree at the Creative Academy. Subsequently she worked as a designer for Chloé and now as a freelance accessory designer. Nimbus Furniture Inspired by nature as well as Van Cleef & Arpels signature cloud pattern, this jeweller’s display takes its name from the Latin word for “cloud”. For this project Andrea Tan considered the juxtaposition of the heaviness of wood and the lightness and movement of nature. Inspired by clouds, Tan chose Van Cleef & Arpels’ cloud motif for the jeweller’s display.